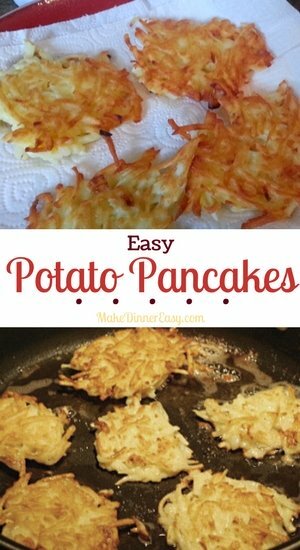 I just about always have a bag of pre-shredded raw potatoes in the house to make these Easy Potato Pancakes. For my family the key to making these delicious is adding diced onion and a bit of salt. As you can see from the photo above, you don't need a lot of oil to brown them. However I have found that keeping the pancakes small in size makes them easier to cook and flip over in the pan. I normally blot them with paper towel to remove any excess oil before serving . You can top them with sour cream or applesauce for a delicious dinner or side dish. 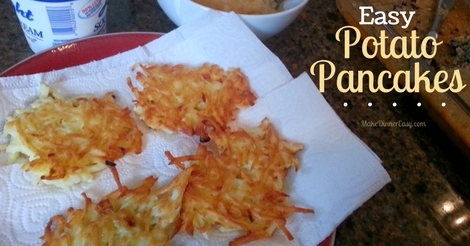 Another option if you have leftover mashed potatoes is to use them to make Mashed Potato Pancakes. Either method is super yummy. Mix the eggs, flour, onion, and salt in a medium size mixing bowl. Add the potatoes and stir to combine. Heat 1/4 inch of canola oil in a large skillet over medium heat. Drop a heaping Tablespoon or Two of the potato mixture into the pan and lower the heat to low. Press the potato mixture down with the back of the spoon. Cook for about 2 minutes on one side (let it brown but not burn) and then flip over and cook another 2 minutes or so until nicely browned on both sides. Remove and allow to drain on a paper towel lined plate before serving. Yield: 14 (3") pancakes.